Plato can work hand-in-hand with other applications to create books, spreadsheets, scholarly articles, mind maps, graphics, and probably any number of other things. It does this through the use of markup and scripts. Markup are snips of XML, HTML, RTF (or any other text formatting method) that are stored in a Plato class library; scripts combine markup with Plato's data to produce documents. 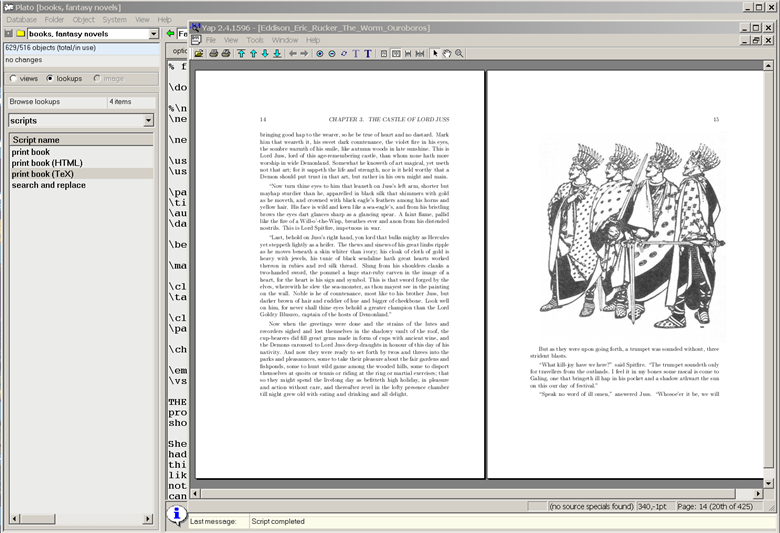 This screenshot shows the output of a Plato script that formats and displays books using the LaTeX markup language. This particular book (The Worm Ouroboros by E. R. Eddison) is stored as individual chapters within a folder in a Plato database. The script opens the folder, attaches the LaTeX document preamble, then goes through each chapter, attaching LaTeX markup as it goes. When it finishes, it creates a file for the new marked-up document. It then runs the file through the LaTeX formatter, which produces an output file. Finally, the script loads the LaTeX output file into a viewer for display, which you see in the screenshot above. Here are some additional web pages and flash videos of Plato in action as it works with external applications.